Joseph K. Goodman | Researcher. Consumer. Human. Professor Goodman is an Associate Professor of Marketing at The Ohio State University’s Fisher College of Business. His research seeks to understand consumer decision making in today’s marketplace. 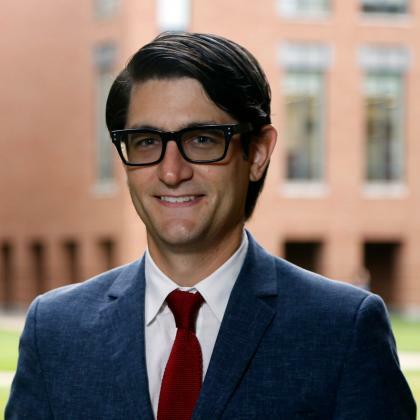 His research interests include consumer happiness and well-being with material and experiential purchases; consumers’ attraction to, and decision making from, large product assortments; and the role of crowdsourcing tools, such as Mechanical Turk, in consumer research. His research has appeared in the requisite journals (JCR, JMR, JCP, JBDM, JACR, OBHDP) and he has taught various courses at the undergrad, graduate, and executive levels. He joined Fisher in 2016 and received his PhD in Marketing at the McCombs School of Business at The University of Texas at Austin. Prior to being a Buckeye, Professor Goodman was on the faculty at the University of South Carolina and Washington University in St. Louis, where he co-founded the CB Research Lab. He enjoys traveling, running, acting like his kids, Europe ‘72, and consuming in the natural habitat. Associate Professor of Marketing, The Ohio State University, Fisher College of Business, 2018 – present. Assistant Professor of Marketing, The Ohio State University, Fisher College of Business, 2016 – 2018. Associate Professor of Marketing, Washington University in St. Louis, Olin Business School, 2013 – 2016. Assistant Professor of Marketing, Washington University in St. Louis, Olin Business School, 2008 – 2013. Assistant Professor of Marketing, University of South Carolina, Moore School of Business, 2007 – 2008. Ph.D., Marketing, McCombs School of Business, The University of Texas at Austin. B.B.A., Business Honors and Marketing, with honors, McCombs School of Business, The University of Texas at Austin. Wright, Scott A. and Joseph K. Goodman (forthcoming), “Mechanical Turk in Consumer Research: Perceptions and Usage in Marketing Academia,” in Handbook of Methods in Consumer Psychology, eds. Frank R. Kardes, Paul M. Herr, and Norbert Schwarz. Ellen, Pam Scholder, June Cotte, and Joseph K. Goodman (2019), “The B-School’s Glass Ceiling,” BizEd, March-April, 42-47. Online here. Goodman, Joseph K., Selin A. Malkoc and Brittney Stephenson (2016) “Celebrate or Commemorate? A Material Purchase Advantage when Honoring Special Life Events,” Journal of the Association for Consumer Research, 1 (4), 497-508. Ward, Morgan K., Joseph K. Goodman, and Julie R. Irwin (2014), “The Same Old Song: The Power of Familiarity in Music Choice,” Marketing Letters, 25, 1, 1-11. Lead Article. PDF HERE. Goodman, Joseph K., Cynthia E. Cryder, and Amar A. Cheema (2013), “Data Collection in a Flat World: Strengths and Weaknesses of Mechanical Turk Samples,” Journal of Behavioral Decision Making, 26 (July), 213-224. PDF via SSRN HERE Top cited paper in JBDM in past 5 years. Goodman, Joseph K. and Caglar Irmak (2013), “Having versus Using: When a Failure to Estimate Usage Makes Consumers Prefer Multi-Feature Products.” Journal of Marketing Research, 50 (February), 44-54. PDF HERE via SSRN HERE. “Do Experiences Lead to more Happiness in Gift Giving?” with Sarah Lim. “Experiential Word-of-Mouth: Consumers Prefer to Talk about Experiences but Review Material Goods,” with Jake Teeny. “Preference for Potential, not Products: The Greater Appeal for Crowdfunding Production,” with Daniel M. Zane. “The Parts Affect the Whole: How Questions about Separate Components of Experiences Influence Consumer Evaluations,” with Daniel Zane and Jake Teeny. See the CB Research Lab Blog for the latest. All things Consumer Behavior: Here We Are Podcast with Shane Mauss, interviewed with Prof. Selin Malkoc, Episode 6, December 15, 2014. NowNews, if you don’t like English and US News & World ReportLadies’ Room Talk Radio Show if you don’t like to read. London Business School Summer Research Camp, “Rethinking the Experiential Advantage,” July 2018, London, England. 9th Biennial Marketing and Public Policy Research Workshop and Doctoral Seminar, “When, Why, and How of Using MTurk for Public Policy Research,” June, 2018, Columbus, OH. Yale Winter Decision Making Symposium, “The Material-Experiential Asymmetry in Discounting: When Experiential Purchases Lead to More Impatience,” January 2018, Miami, Fl. University of Maryland Research Camp, “The Material-Experiential Asymmetry in Discounting: When Experiential Purchases Lead to More Impatience,” October, 2017, College Park, MD. Symposium on Alienation and Meaning in Production and Consumption, “Directions for (De)Alienation and Meaning,” January 2017, Munich, Germany. The Ohio State University, Behavioral Lab Brownbag, “Crowdsourcing Consumer Research: A Guide and Review of Mechanical Turk,” January, 2017. Group for Attitudes and Persuasion (GAP), Psychology Department, The Ohio State University, “Giving happiness: Why we give material gifts when experiences make us happier,” September, 2016. Duke University, “Discounting a Lump-sum vs. Payment Stream: More Payments leads to More Patience,” Marketing Seminar Series, May, 2016. University of Illinois Chicago, Marketing Seminar Series, “Rethinking the Experiential Advantage,” Chicago, Il, March, 2016. The Ohio State University, Marketing Seminar Series, “Rethinking the Experiential Advantage,” Columbus, OH, January, 2016. Arizona State University, Marketing Seminar Series, “Celebrate or Commemorate? When Material Purchases Lead to Stronger Memories and More Happiness than Experiences,” Tempe, AZ, December, 2015. ACR Workshop, “How and When to Ask the Turk: Tips for Using Amazon’s Mechanical Turk to Conduct Consumer Research,” workshop at the meetings of the Association for Consumer Research, New Orleans, LA, October 2015. INSEAD, Marketing Seminar Series, “Celebrate or Commemorate? When Material Purchases Lead to Stronger Memories and More Happiness than Experiences,” Fontainebleau, France, June 19, 2015. ACR Workshop, “Questioning the Turk: Conducting High Quality Research with Amazon Mechanical Turk,” with Gabriele Paolacci, in NA – Advances in Consumer Research Volume 42, eds. June Cotte and Stacy Wood, Duluth, MN: Association for Consumer Research, Pages: 766-766. SLIDES AVAILABLE HERE. Olin Faculty Research Symposium, “In Defense of Materialism: Rethinking the Experiential Advantage on Consumer Happiness,” May 2, 2014. Marketing in Israel 13 (Tel Aviv University, Hebrew University, and IDC), “Giving Happiness: Rethinking the Experiential Advantage on Consumption Happiness,” January 1, 2014. Olin Praxis: Research that Impacts Business, Washington University in St. Louis, “When Consumers Don’t Want Choices,” December 2013. Link. University of California, Irvine, “Rethinking the Experiential Advantage on Consumption Happiness,” Irvine, CA, November 2013. HEC Paris, Marketing Seminar Series, “Having versus Using: When a Failure to Estimate Usage Makes Consumers Prefer Multi-Feature Products,” Paris, France, February 2013. University of California, San Diego, “Having versus Using: When a Failure to Estimate Usage Makes Consumers Prefer Multi-Feature Products,” San Diego, CA, December 2012. Yale Summer Decision Making Symposium, “Having versus Using: When a Failure to Estimate Usage Makes Consumers Prefer Multi-Feature Products,” New York City, NY, May 2012. University of California Riverside, Marketing Seminar Series, “Having versus Using: When a Failure to Estimate Usage Makes Consumers Prefer Multi-Feature Products,” Riverside, CA, May 2012. Katholieke Universiteit Leuven, Marketing Seminar Series, “Having versus Using: When a Failure to Estimate Usage Makes Consumers Prefer Multi-Feature Products,” Leuven, Belgium, November 2011. Özyeğin University, Marketing Seminar Series, “Choosing for Here and Now vs. There and Later: The Moderating Role of Construal on Assortment Size Preferences,” Istanbul, Turkey, July 2011. University of Missouri, St. Louis, Spring Seminar Series, “Choosing for Here and Now vs. There and Later: The Moderating Role of Construal on Assortment Size Preferences.” St. Louis, MO, May 2011. Washington University in St. Louis, Marketing Seminar Series, “Consumer and Retailer Strategies when Choosing from Large Assortments,” Olin Business School, St. Louis, MO, November 2007. INSEAD, Marketing Seminar Series, “Happiness for Sale: Do Experiential Purchases Make Consumers Happier than Material Purchases?” Fontainebleau, France, September 2007. University of Houston 13th Annual Doctoral Symposium, C.T. Bauer School of Business, Houston, TX. Indiana University, 34th Annual Haring Symposium, Kelley School of Business, Bloomington, IN. Goodman, Joseph K.* and Kathleen D. Vohs, “The Psychological Value of Material Goods,” presented (in special session) at the Society for Consumer Psychology conference, Savannah, GA, March 2019. Oh*, Hyewon, Joseph K. Goodman, and Incheol Choi, “Reversing the Experiential Advantage: Happiness Leads People to Perceive Purchases as More Experiential than Material,” presented (in special session) at the Society for Consumer Psychology conference, Savannah, GA, March 2019. Wiengarten*, Evan and Joseph K. Goodman, “The Experiential Advantage: A Meta-Analysis,” presented (in special session) at the Association for Consumer Research conference, Dallas, TX, October 2018. Oh*, Hyewon, Joseph K. Goodman, and Incheol Choi, “Reversing the Experiential Advantage: Happiness Leads People to Perceive Purchases as More Experiential than Material,” presented (in special session) at the Association for Consumer Research conference, Dallas, TX, October 2018. Oh, Hyewon, Joseph K. Goodman*, and Incheol Choi, “Reversing the Experiential Advantage: Happiness Leads People to Perceive Purchases as More Experiential than Material,” presented (in special session) at the European Association for Consumer Research conference, Ghent, Belgium, June 2018. Oh*, Hyewon, Joseph K. Goodman, and Incheol Choi, “Reversing the Experiential Advantage: Happiness Leads People to Perceive Purchases as More Experiential than Material,” presented at the Marketing and Public Policy Conference, Columbus, OH, June 2018. Goodman, Joseph K., Malkoc, and Mosi Rosenboim, “Experiential Asymmetry in Discounting: When Experiential Purchases Lead to More Impatience,” presented (in special session) at the meetings of the Society for Consumer Psychology, Dallas, TX, February 2018. Goodman, Joseph K. and Sarah Lim*, “Giving Happiness: Why We Give Material Gifts when Experiences Make Us Happier,” presented (in special session) at the meetings of the Society for Consumer Psychology, San Francisco, CA, February 2017. Goodman*, Joseph K., Selin A. Malkoc, and Mosi Rosenboim, “The Material-Experiential Asymmetry in Present Bias: Why Material Items Lead to Less Present Biased Preferences,” presented (in special session) at the meetings of the Society for Consumer Psychology, St. Pete Beach, FL, February 2016. Goodman*, Joseph K. and Rebecca Walker Reczek, “When Consumers Prefer to Include: Consideration Set Construction Strategies from Large Product Assortments,” presented (in special session) at the meetings of the Society for Consumer Psychology, Phoenix, AZ, March 2015. Goodman*, Joseph K. and Gabrielle Paolacci* (2014), “Questioning the Turk: Conducting High Quality Research with Amazon Mechanical Turk,” in NA – Advances in Consumer Research, Volume 42, eds. June Cotte and Stacy Wood, Duluth, MN: Association for Consumer Research, Pages: 766-766. Goodman*, Joseph K. and Rebecca Walker Reczek, “When Consumers Prefer to Include: Consideration Set Construction Strategies from Large Product Assortments,” presented (in special session) at Association for Consumer Research, Baltimore, MD, October 2014. Goodman*, Joseph K. and Sarah Lim, “Giving Happiness: Do Experiential Gifts Leads to More Happiness?” presented (in special session) at Association for Consumer Research, Baltimore, MD, October 2014. Dalton*, Brittney L., Joseph K. Goodman, and Selin A. Malkoc, “Celebrate or Commemorate? When Material Items Lead to Stronger Memories and Greater Positive Affect,” presented (in special session) at Association for Consumer Research, Baltimore, MD, October 2014. Goodman*, Joseph K., “Giving and Receiving Happiness,” presented (in special session) at the meetings of the Society for Consumer Psychology, Miami Fl, March 2014. Goodman*, Joseph K., “Mechanical Turk 2.0: Issues, Limitations, and Solutions for Collecting Data in a Mechanical World,” roundtable at the meetings of the Association for Consumer Research, Chicago, IL, October 2013. Goodman*, Joseph K. and Kathleen Vohs, “One of Each: Variety Seeking to Avoid Choice Difficulty,” to be presented (in special session) at the meetings of the Association for Consumer Research, Chicago, IL, October 2013. Goodman*, Joseph K. and Kathleen Vohs, “One of Each: Variety Seeking to Avoid Choice Difficulty,” ISMS Marketing Science Conference, Istanbul, Turkey, July 2013. Goodman*, Joseph K., Cynthia E. Cryder, and Amar A. Cheema, “Data Collection in a Flat World: Strengths and Weaknesses of Mechanical Turk Samples,” presented (in special session) at the meetings of the Association for Consumer Research, Vancouver, BC, October 2012. Goodman*, Joseph K. and Selin A. Malkoc, “Goodman, Joseph K. and Selin A. Malkoc (2012), “Choosing for Here and Now vs. There and Later: The Moderating Role of Construal on Assortment Size Preferences,” presented at the International conference of the Society for Consumer Psychology, Florence, Italy, June, 2012. Goodman,*Joseph K. and Selin A. Malkoc, “Choosing for Here and Now vs. There and Later: The Moderating Role of Construal on Assortment Size Preferences,” presented at the meetings of the Society for Consumer Psychology, Las Vegas, NV, February, 2012. Goodman, Joseph K. and Caglar Irmak (2012), “Having versus Consuming: How Failing to Estimate Usage Frequency Affects Consumer Preferences for Mulit-Feature Products,” in Advances in Consumer Research Volume 39, R. Ahluwalia, T. L. Chartrand, and R. K. Ratner (Eds. ), 628-629. Goodman*, Joseph K. and Caglar Irmak, “Having versus Using: When a Failure to Estimate Usage Makes Consumers Prefer Multi-Feature Products.” presented at the meetings of the Association for Consumer Research, St. Louis, MO, October 2011. Goodman*, Joseph K., Cynthia E. Cryder, and Amar A. Cheema, “Data Collection in a Flat World: Strengths and Weaknesses of Mechanical Turk Samples,” presented at the meetings of the Society for Judgment and Decision Making, St. Louis, MO, November, 2010. Goodman*, Joseph K., Rajagopal Raghunathan, and Susan Broniarczyk, “A Single Global Brand or Branded Variants? The Role of Differentiation on Brand Portfolio Strategy,” presented at the Global Brand Management Conference, Koc University, Istanbul, Turkey, June, 2010. Malkoc*, Selin A. and Joseph K. Goodman, “Is More Always Better? The Role of Construal on Assortment Size Preference,” presented (in special session) at the meetings of the Society for Consumer Psychology, St. Pete Beach, FL, February, 2010. Goodman, Joseph K. (2009), “Exclude or Include? Consideration Set Strategies and the Choice Process,” in Advances in Consumer Research Volume 36, A. L. McGill and S. Shavitt (Eds. ), 214-217. Goodman*, Joseph K., Susan Broniarczyk, Jill Griffin, and Leigh McAlister, “Simplify or Intensify? Best Seller Signage on Consumer Decision Making from Large Product Assortments” presented (in special session) at the meetings of the Association for Consumer Research, San Francisco, CA, October, 2008. Goodman*, Joseph K. and Susan Broniarczyk, “Screening from Large Assortments: The Use of Include and Exclude Strategies in Consideration Set Construction” presented (in special session) at the meetings of the Association for Consumer Research, San Francisco, CA, October. 2008. Nicolao*, Leonardo, Julie R. Irwin, and Joseph K. Goodman, “Happiness for Sale: Do Experiential or Material Purchases Lead to Greater Consumer Happiness?” presented at the meetings of the Society for Judgment and Decision Making, Long Beach, CA, November, 2007. Irwin, Julie R., Joseph K. Goodman, and Leonardo Nicolao*, “Happiness for Sale: Do Experiential or Material Purchases Lead to Greater Consumer Happiness?” presented (in special session) at the meetings of the Association for Consumer Research, Memphis, TN, October, 2007. Goodman*, Joseph K. and Cait Poynor, “From Small Slice to Big Picture: The Relationship Between Local Display Breadth, Assortment, and Variety,” presented at the meetings of the Society for Consumer Psychology, Las Vegas, NV, February, 2007. Ward*, Morgan K., Joseph K. Goodman, and Julie R. Irwin, “I Want It Even Though I Do Not Like It: Preference for Familiar but Less Liked Music” presented (in special session) at the meetings of the Society for Consumer Psychology, Miami, FL, February, 2006. Goodman*, Joseph K. and Susan Broniarczyk, “Clash of Personalities: The Role of the Corporate Brand in Product Brand Portfolios” competitive paper presented at the meetings of the Association for Consumer Research, San Antonio, TX, October, 2005. Goodman, Joseph K. (2005), “Faulty Reasoning and Gambling Behavior,” Special Session Summary, in Advances in Consumer Research Volume 32, G. Menon and A. R. Rao, (Eds. ), 131-133. Goodman*, Joseph K. and Julie R. Irwin, “Special Random Numbers: Beyond the Illusion of Control,” (in special session) presented at the meetings of the Association for Consumer Research, Portland, OR, October 2004. Goodman*, Joseph K. and Julie R. Irwin, “Special Random Numbers: Beyond the Illusion of Control,” presented at Behavioral Decision Research in Management Conference, Duke University, April, 2004. Goodman*, Joseph K. and Julie R. Irwin, “Special Random Numbers: Beyond the Illusion of Control,” presented at the meetings of the Society for Judgment and Decision Making, Vancouver, Canada, November 2003. Broniarczyk*, Susan, Joseph K. Goodman, Jill Griffin, and Leigh McAlister, “Too Many Choices: The Effect of Assortment on Anticipated and Post-Consumption Regret,” presented (in special session) at the meetings of the Association for Consumer Research, Toronto, Canada, October, 2003. Goodman*, Joseph K. and Julie R. Irwin, “Reluctance to Concede Randomness: Specialized Random Numbers,” competitive paper presented at the meetings of the Association for Consumer Research, Toronto, Canada, October, 2003. DeFanti, Mark P. and Joseph K. Goodman (2005), “Brand Architecture and Corporate Reputation,” Marketing Science Institute Conference Summary, Report No. 05-303, 20p, Charleston, SC, March 17-18. Outstanding Reviewer Award, Journal of Consumer Psychology, 2016. Outstanding Reviewer Award, Journal of Consumer Research, 2015. Invited Faculty Fellow, Society for Consumer Psychology Doctoral Symposium, 2013, 2014, 2015, 2016, 2017. Invited Faculty Fellow, Association for Consumer Research Doctoral Symposium, 2011, 2015, 2016, 2018. Fred Moore Assistant Instructor Award for Teaching Excellence, McCombs School of Business, The University of Texas at Austin, May 2007. AMA-Sheth Foundation Doctoral Fellow, University of Connecticut, July 6-10, 2005. The University of Texas at Austin Continuing Fellowship, Office of Graduate Studies 2005. 13th Annual University of Houston Doctoral Symposium Fellow, Houston, TX, 2004. The University of Texas at Austin Bruton Fellowship, 2003, 2004. 34th Annual Haring Symposium Fellow, Indiana University, Bloomington, IN, 2003. Dean’s Fellowship, McCombs School of Business, The University of Texas at Austin, 2003, 2004. The University of Texas at Austin Pre-Emptive Fellowship, Office of Graduate Studies, 2003. The University of Texas at Austin Dean’s List, 1997-2001. Associate Editor, Journal of Consumer Psychology. Editorial Review Board, Journal of Marketing. Editorial Review Board, Journal of Consumer Research. Conference Social Chair (with Franklin Shaddy), Society for Consumer Psychology Annual Conference, Huntington Beach, CA, March 2020. Conference Track Chair (with Rosellina Ferraro), Society for Consumer Psychology Annual Conference, Dallas, TX, February 2018. Conference Co-Chair (with Kristin Diehl), Society for Consumer Psychology Doctoral Consortium, Phoenix, AZ, February 2015. Associate Editor, Association for Consumer Research (ACR) Annual Conference, 2016. Advisory Panel, Society for Consumer Psychology (SCP), 2012-2015. Sage Open, guest editor and Ad Hoc Reviewer. Program Committee, Association for Consumer Research (ACR) Annual Conference, 2013, 2016, 2017, 2018, 2019. Program Committee, CBSIG Conference, Managerially Relevant Consumer Insights: Crossing Boundaries, 2019. Symposium Reviewer, Society for Consumer Psychology (SCP) Annual Conference 2009, 2010, 2012, 2013, 2014, 2016, 2019. Publicity Committee, Society for Consumer Psychology, 2013. Marketing Faculty Search Committee Chair, Department of Marketing & Logistics, The Ohio State University, 2018-2019. Core Academy Committee, Fisher College of Business, The Ohio State University, 2017-present. Marketing and Undergraduate Committee, Department of Marketing & Logistics, The Ohio State University, 2017-present. Marketing Research Brownbag Coordinator, The Ohio State University, 2017-2018. Outreach and Engagement Committee, Department of Marketing & Logistics, The Ohio State University, 2018. Marketing & Logistics Integration Committee, Department of Marketing & Logistics, The Ohio State University, 2018. Haring Symposium Faculty Representative, Indiana University, April 2017. Course Evaluation Committee Member, Washington University in St. Louis, 2011-2012. Disciplinary Committee, Washington University in St. Louis, 2013-2014. Marketing Seminar Series Coordinator, Washington University in St. Louis, 2012. Research Pool Coordinator, Olin Business School, Washington University in St. Louis, 2008-2016. Faculty Co-Director, Olin Behavioral Lab, Washington University in St. Louis, 2014-2016. Co-Director of CB Research Lab, Washington University in St. Louis, 2008-2016, Fisher College of Business, The Ohio State University, 2016-present. Workshop Chair, ” How and When to Ask the Turk: Tips for Using Amazon’s Mechanical Turk to Conduct Consumer Research,” 2015 meetings of the Association for Consumer Research, New Orleans, LA. Workshop Co-Chair (with Gabriele Paolacci), “Questioning the Turk: Conducting High Quality Research with Amazon Mechanical Turk,” 2015 meetings of the Association for Consumer Research, Baltimore, MD. Roundtable Session Chair, “Mechanical Turk 2.0: Issues, Limitations, and Solutions for Collecting Data in a Mechanical World,” 2013 meetings of the Association for Consumer Research, Chicago, IL. Session Chair, International Society for Consumer Psychology Conference, 2012. Special Session Chair, “Choosing for Tomorrow: The Influence of Affect and Temporal Distance,” 2011 meetings of the Association for Consumer Research, St. Louis, MO. Special Session Chair, “Exclude or Include? Consideration Set Strategies and the Choice Process,” 2009 meetings of the Association for Consumer Research, San Francisco, CA. Special Session Chair, “Constrained Preferences: A Look into the Preference/Choice Inconsistency,” 2006 meetings of the Society for Consumer Psychology, Miami, FL. Special Session Chair, “Faulty Reasoning and Gambling Behavior,” 2004 meetings of the Association for Consumer Research, Portland, OR. Principles of Marketing (BUSML 3250), core class, 780 students, multiple campuses, The Ohio State University, Spring 2017, Spring 2018. Flexibility and Decisiveness, Brookings Executive Education (Brookings Institution and Washington University in St. Louis), NASA Marshall Space Flight Center, July 2015, 2018, Washington, D.C., September 2015, 2016, 2017, 2018. Brand Management MKT (MKT 400F), Washington University in St. Louis, Spring 2014, 2015, 2016. Understanding and Influencing Consumer Behavior (MKT 576A, MBA and PMBA), Washington University in St. Louis, Fall 2009, 2010, 2011, 2012. Consumer Behavior (MKT 377, BSBA), Washington University in St. Louis, Fall 2009, 2010, 2011, 2012. Judgment and Decision Making Seminar (MKT 674, PhD), Washington University in St. Louis, Spring 2010. Principles of Marketing (MKT 370, BSBA), Washington University in St. Louis, Fall 2008. Consumer Behavior (MKTG 351), University of South Carolina, Fall 2007. Principles of Marketing* (MKT 337), The University of Texas at Austin, Spring 2006. *Awarded the Fred Moore Assistant Instructor Award for Teaching Excellence.